The second Sunday in May is one of my favourite events, held near Kritsa, Crete. Villagers hold this annual memorial to celebrate how Rodanthe, now known as Kritsotopoula, Girl of Kritsa and her fellow rebels fought against a combined Turk and Arab force back in 1823. When we first came to Kritsa the only memorial to this significant battle was the date, 1823, daubed on a piece of pipe at the roadside. It is still there, but now a magnificent sculpture by British Kritsa resident, Nigel Ratcliffe provides the centrepiece for the memorial service. Local children, and other key participants in the event, were transported the 3k from Kritsa to the battle site near Lato in the popular Little Blue Train. Once there, smiling teachers had a task, similar to herding cats, as they organised the youngest ones for flag carrying duty. They looked so proud as they led the procession and then stood patiently beside the memorial during the service and wreath laying. I’d not even switched my camera on when I saw this tot. At least I caught enough of a photo to show how tiny she was. 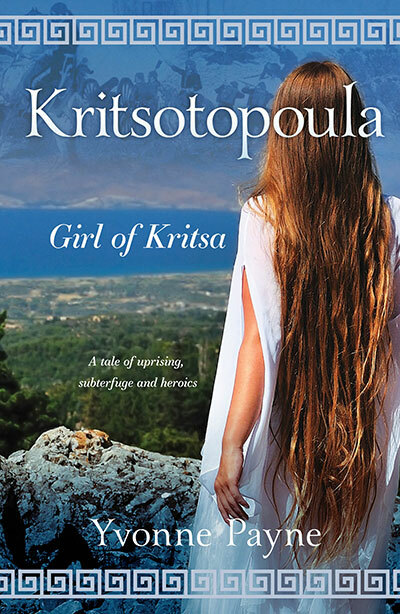 To me it was as if she’d stepped out of the pages of my novel, Kritsotopoula, Girl of Kritsa. She looked just how I describe young Rodanthe the Christmas she received her first and only complete set of new clothes. Ceremony over, participants and audience enjoyed a lunch of local foods, while Kritsotopoula enjoyed her solitude once more. If you’d like to read my novel, based on the true story of this remarkable Kritsa woman Click Here. I am glad they have a lovely memorial to acknowledge the terrible battle.